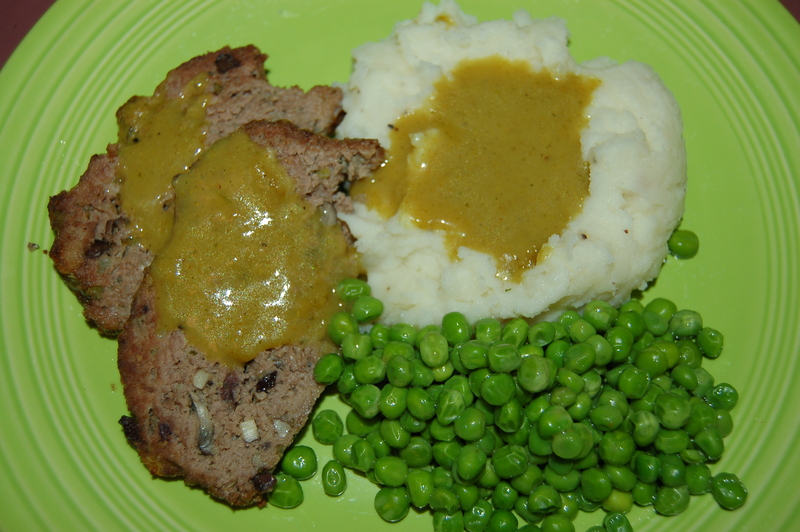 Flavorful Meatloaf with Curried Gravy, Creamy Mash & Peas AND A Word About Washing-Up! (serves 6-8) | Crappy Kitchen - Good Dinners! This is one of those dinners I make every once in a while when I am begged. And the reason that it requires begging is simple: too many pots and pans!!! It is most certainly worth it when it is all over, however I have no plans to make this dish for at least another six months, or perhaps not until it is someone’s dying wish. So how many pans are we talking about here: well there is a pan to saute the vegetables, a large baking tray to cook the meatloaf, a pot for boiled and mashed potatoes, a pan for gravy and a saucepan for the peas. Oh, and I forgot, the large mixing bowl for the raw ground meat and seasonings. When I make a dinner like this I always think about my mother who cooked dinners like this every night (actually not meatloaf in Ireland but you know what I mean). She had a pot for veggies, a pan or pot for meat, a pot of potatoes (always!) and a pan for sauce. How she didn’t go insane with all of those pots to shuffle around on the stove is beyond me, and then the pile of washing-up? The washing-up became my and my sister’s headache when we were old enough to reach the basin of water! Maybe that’s why I shy away from “meat and potato” dinners. It reminds me of the unending piles of dish, pots, pans, knives, forks and cups for tea afterwards. This was of course all done without a dishwasher, sure it’s no wonder I openly declare love for my dishwasher every single day. I can’t believe I am giving a recipe for something delectable while also complaining about how laborious it is to prepare. But it feels refreshing to be totally blunt and to let you know what you are getting yourself into by choosing to cook this on perhaps a busy week night when you can barely stand. In other words, leave this dinner for a day when nothing would suit you better than to hide away in the kitchen for a bit by yourself and you feel the need to fuss over pots and pans. It is also important to tell you that even if you have a dishwasher make sure to rinse anything that has been in contact with those starchy mashed potatoes, or you will get a crust on every glass that is washed along with it! 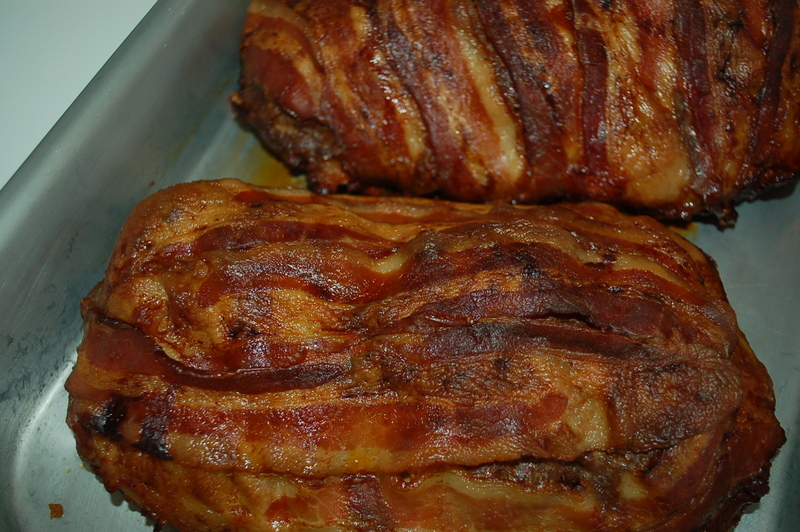 On the very bright side, it is a delicious meal and if you make two loaves as I did, the leftovers are an absolute treasure the next day or the day after, to be fried, a filling for sandwiches, or even warmed, sliced and wrapped in romaine leaves for lunch. My hat is off to anyone who tackles dinners like this on a regular basis, and that there are enthusiastic helpers when it comes to the washing-up! 1 – Put saute pan on medium heat and add the oil. When it has warmed for a minute add the onions, garlic, celery and mushrooms to the pan and cook for about 15 minutes, stirring occasionally. Take off heat and set aside. 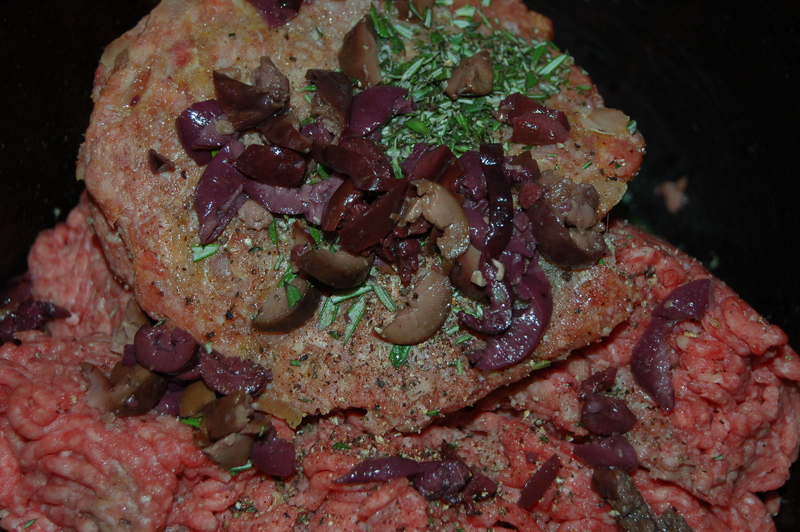 3 – When the veggies are cooked and have cooled down a bit, add to the meat also. Mix everything together until very well mixed (I use my hands). 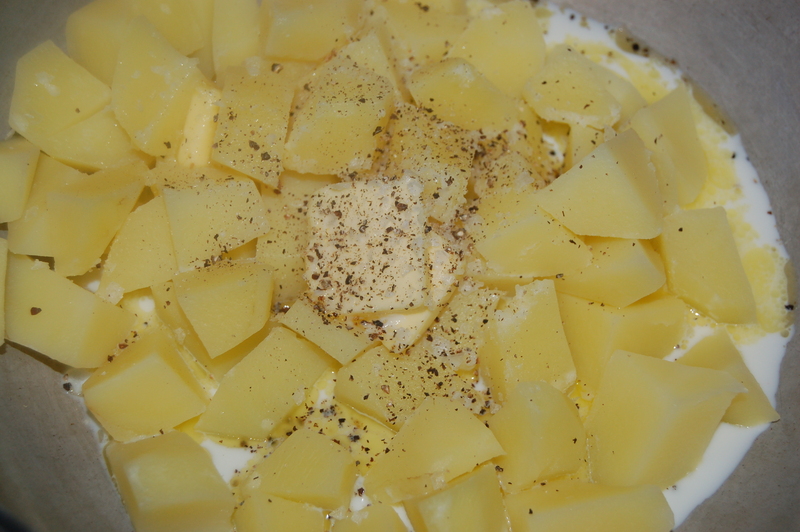 4 – Divide the mixture into two and put on a greased baking tray. Form into “loaves” and bake in the preheated oven for about 50 minutes to 1 hour. 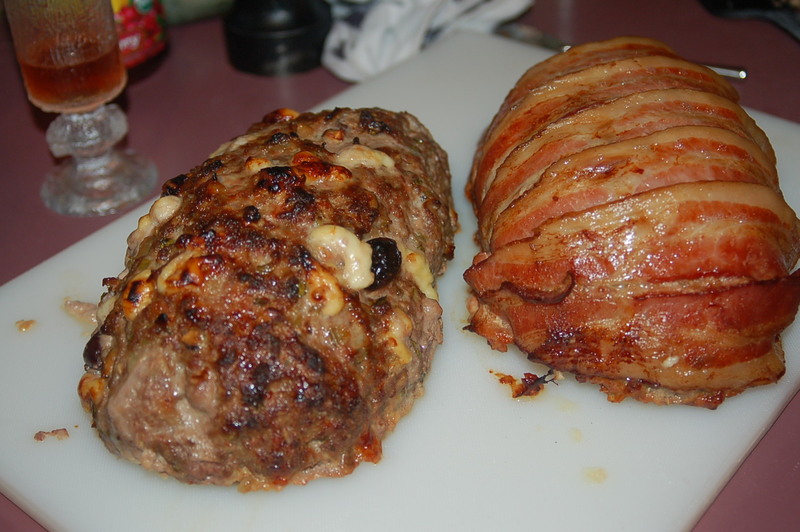 5 – Take out and cover loosely with foil and let rest for about 10 to 15 minutes before thickly slicing. In the meantime, make the gravy and put the potatoes on to boil. 1 – Peel and cut the potatoes and place in a saucepan and cover with cold water. Place lid on pot and boil until soft. Check, and when a knife goes through the center of the potato easily, they are done. 2 – Drain the water and add the rest of the mash ingredients and mash with a potato masher until well mixed and have a creamy consistency. Taste for further seasoning and adjust to your taste. Cover loosely with a cloth and set aside on stove-top. 1 – Put saucepan on low/ medium heat and add the butter. 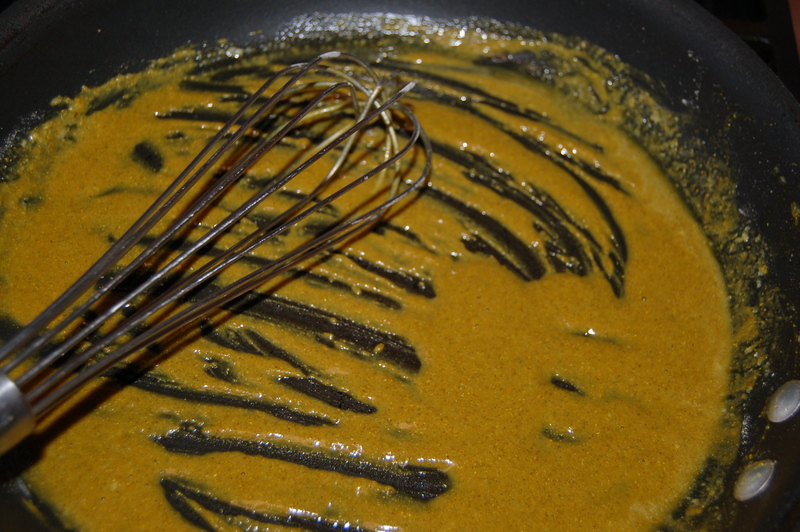 When it melts add the curry powder and mix. Add the flour and mix until you have a smooth paste (use a manual whisk for the job). 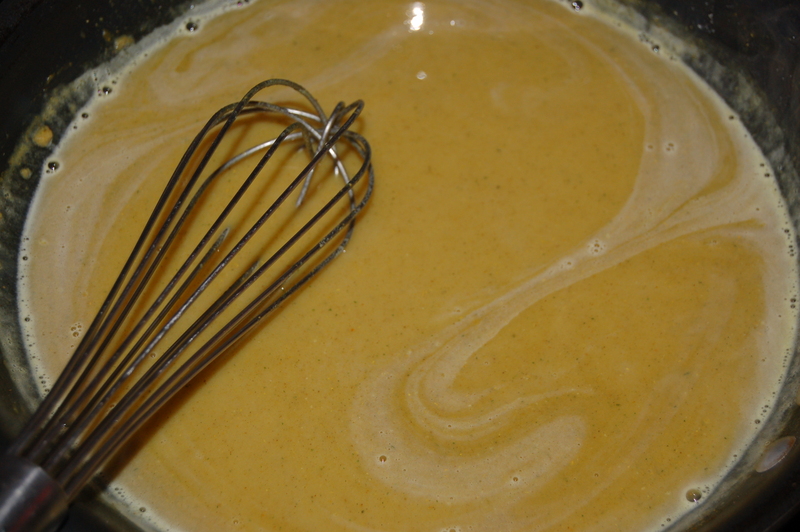 2 – Add 1 cup of the stock and mix until smooth. Add the rest of the liquid and turn the heat up to medium and cook until sauce is simmering, whisking pretty constantly. Cook for about 4 minutes while it is simmering, then turn off heat. Taste and adjust seasoning with salt and pepper if necessary. 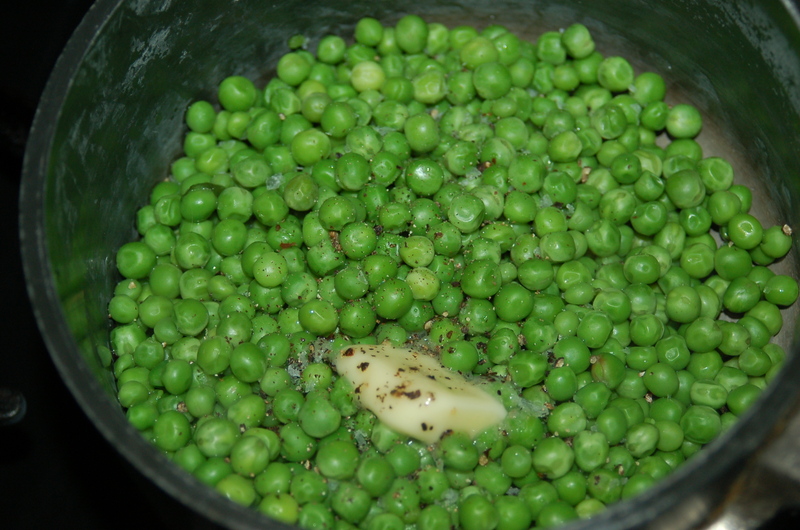 Cook peas in a little boiling water until cooked (about 3 minutes). Drain and season with a little pepper and a knob of butter. 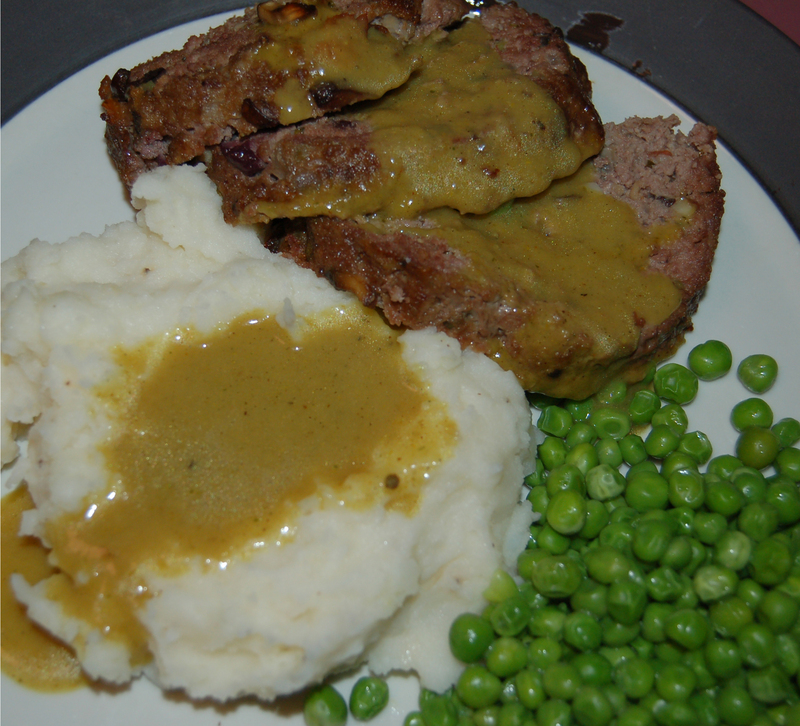 To serve: Add mash to each plate, along with slices of meatloaf, peas and plenty of gravy! 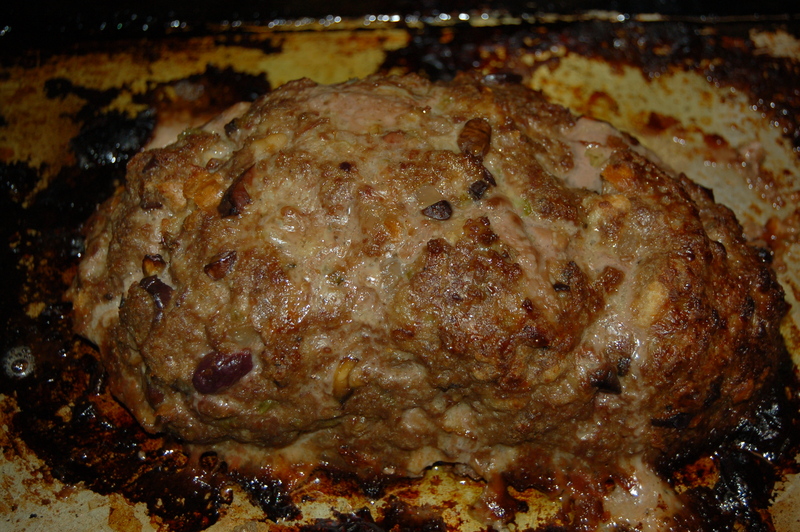 This entry was posted in dinners and tagged baby peas, creamed spinach, curry gravy, curry sauce, gravy, ground meat, mashed potatoes, meat loaf, meatloaf sandwich. Bookmark the permalink. That looks really good Tess!!! i hear you about the mess and clean up, but it looks fantastic! 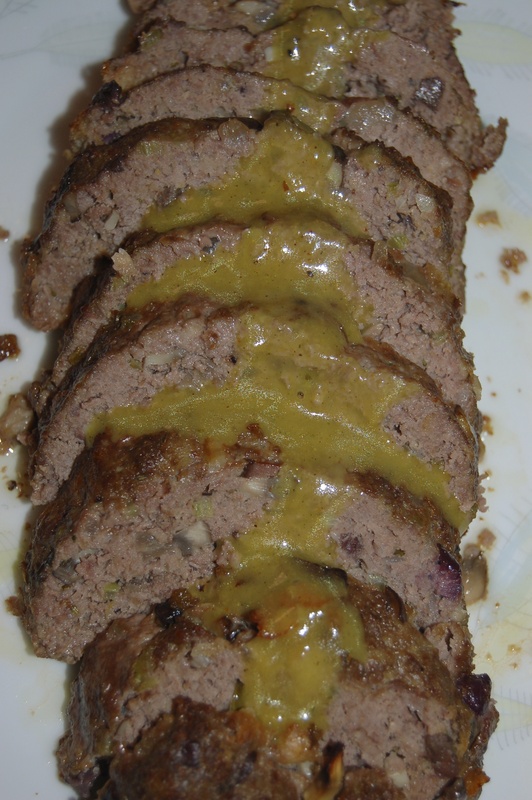 You know… If you made the meatloaf the day before, the rest of it is a doddle! I know what you mean about the wash up…. As you know, I’m still washing dishes by hand! 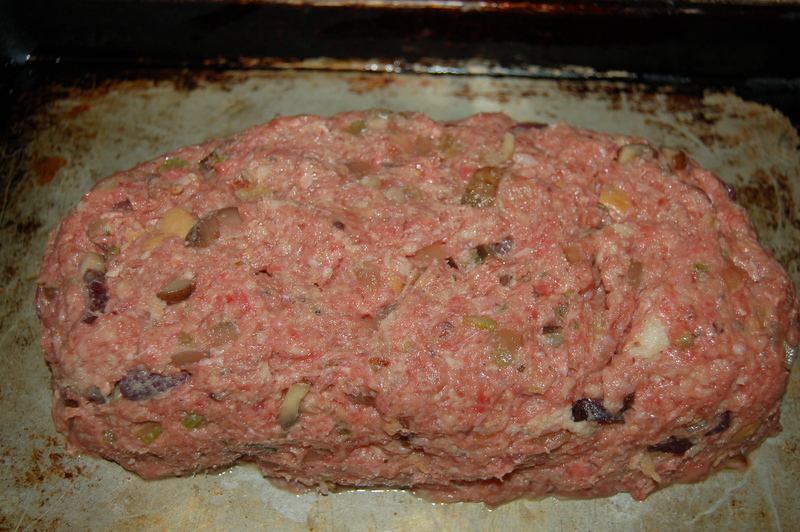 I haven’t made meatloaf for about 18 months and your one looks Devine. doesn’t it just – however if you are on the Blood Type A diet it is off limits!